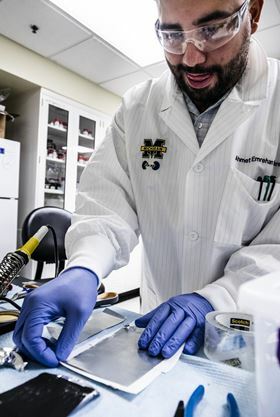 Ahmet Emrehan Emre, a biomedical engineering PhD candidate at the University of Michigan, sandwiches a thin sheet of a cartilage-like material between a layer of zinc on top and a layer of manganese oxide beneath to form a battery. Photo: Evan Dougherty/Michigan Engineering. Your knees and your smartphone battery have some surprisingly similar needs, a professor at the University of Michigan has discovered. This new insight has led to a ‘structural battery’ prototype that incorporates a cartilage-like material to make the batteries highly durable and easy to shape. The idea behind structural batteries is to store energy in structural components – the wing of a drone or the bumper of an electric vehicle, for example. They've been a long-term goal for researchers and industry because they could reduce weight and extend range. But structural batteries have so far been heavy, short-lived or unsafe. In a paper published in ACS Nano, researchers at the University of Michigan now describe making a damage-resistant rechargeable zinc battery with a cartilage-like solid electrolyte and showing that it could replace the top casings of several commercial drones. These prototype cells can run for more than 100 cycles at 90% capacity, and withstand hard impacts and even stabbing without losing voltage or starting a fire. "A battery that is also a structural component has to be light, strong, safe and have high capacity. Unfortunately, these requirements are often mutually exclusive," said Nicholas Kotov, a professor of engineering at the University of Michigan, who led the research. To sidestep these trade-offs, the researchers used zinc – a legitimate structural material – and branched nanofibers that resemble the collagen fibers of cartilage. "Nature does not have zinc batteries, but it had to solve a similar problem," Kotov said. "Cartilage turned out to be a perfect prototype for an ion-transporting material in batteries. It has amazing mechanics, and it serves us for a very long time compared to how thin it is. The same qualities are needed from solid electrolytes separating cathodes and anodes in batteries." In our bodies, cartilage combines mechanical strength and durability with the ability to let water, nutrients and other materials move through it. These qualities are nearly identical to those of a good solid electrolyte, which has to resist damage from dendrites while also letting ions flow from one electrode to the other. Dendrites are tendrils of metal that can pierce the separator between the electrodes and create a fast lane for electrons, shorting the circuit and potentially causing a fire. Zinc has previously been overlooked for rechargeable batteries because it tends to short out after just a few charge/discharge cycles. Not only can the membranes made by Kotov's team ferry zinc ions between the electrodes, they can also stop zinc's piercing dendrites. Like cartilage, the membranes are composed of ultra-strong nanofibers interwoven with a softer, ion-friendly material. In the batteries, aramid nanofibers – the stuff in bulletproof vests – stand in for the collagen in cartilage, with polyethylene oxide (a chain-like, carbon-based molecule) and a zinc salt replacing the soft components. To make working cells, the team paired the zinc electrodes with manganese oxide – the combination found in standard alkaline batteries. But in these rechargeable batteries, the cartilage-like membrane replaces the standard separator and alkaline electrolyte. As secondary batteries on drones, the zinc cells can extend the flight time by 5–25% – depending on the battery size, mass of the drone and flight conditions. Safety is critical to structural batteries, so the team tried deliberately damaging their cells by stabbing them with a knife. In spite of multiple ‘wounds’, the battery continued to discharge close to its design voltage. This is possible because there is no liquid to leak out. For now, the zinc batteries are best as secondary power sources, because they can't charge and discharge as quickly as their lithium-ion brethren. But Kotov's team intends to explore whether there is a better partner electrode that could improve the speed and longevity of these zinc rechargeable batteries. This story is adapted from material from the University of Michigan, with editorial changes made by Materials Today. The views expressed in this article do not necessarily represent those of Elsevier. Link to original source. Scientists have developed a novel garnet-type, fast ionic conducting oxide as a solid electrolyte in an all-solid-state rechargeable battery. Scientists have developed a solid-state lithium ion battery with a porous lithium garnet electrolyte and a viscous electrode that seeps into the pores.